We used a retaining garden wall to create some outdoor living space at a property in Farnham, as the existing rear garden rose at a steep angle from the back of the house. 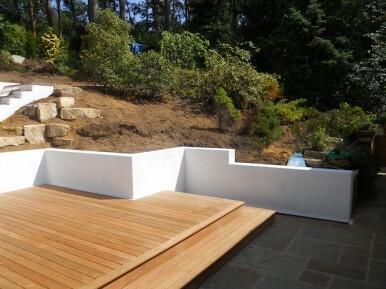 We excavated over 200 tonnes of soil to create a terraced area retained by rendered blockwork walls. We had to gain planning permission for the works as well as consulting structural engineers to ensure the walls would be strong enough to retain the upper ground.